Open Internet proponents who have been fighting the Trump administration’s rollback of net neutrality protections, which has been enacted at the bidding of the telecom industry, said Tuesday that Comcast is now threatening legal action saying the website Comcastroturf.com is infringing on its trademark. 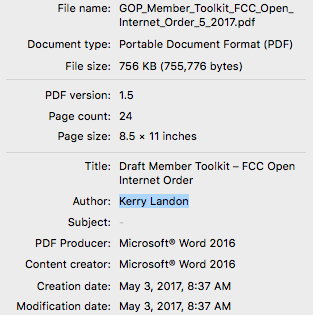 The website in question is currently providing a tool for the public to see if their names are among those stolen and used by anti-net neutrality bots to post comments in support of the Federal Communications Commission (FCC) plan to undo Title II protections that classify the internet as a public utility. “This is exactly why we need Title II net neutrality protections that ban blocking, throttling, and censorship,” said Evan Greer, campaign director of Fight for the Future. “It also makes you wonder what Comcast is so afraid of? Are their lobbying dollars funding the astroturfing effort flooding the FCC with fake comments that we are encouraging Internet users to investigate?” she asked. Indeed, the fake comment scandal in addition to the FCC’s failure to process comments in favor of net neutrality drew sharp criticism in the wake of the FCC’s vote, and raised concern over how much influence the telecom industry holds over Pai, and now the FCC. In case there was any question on that front, The Intercept’s Lee Fang and Nick Surgey reported on Tuesday on an internal email from GOP leadership instructing House Republicans on how best to defend the FCC’s decision. Lauren McCauley is an assistant editor at Common Dreams and a documentary producer; her most recent film is Mississippi Messiah, about civil rights leader James Meredith.